GraceConnect » Groups Partner to Provide Relief in C.A.R. Groups Partner to Provide Relief in C.A.R. 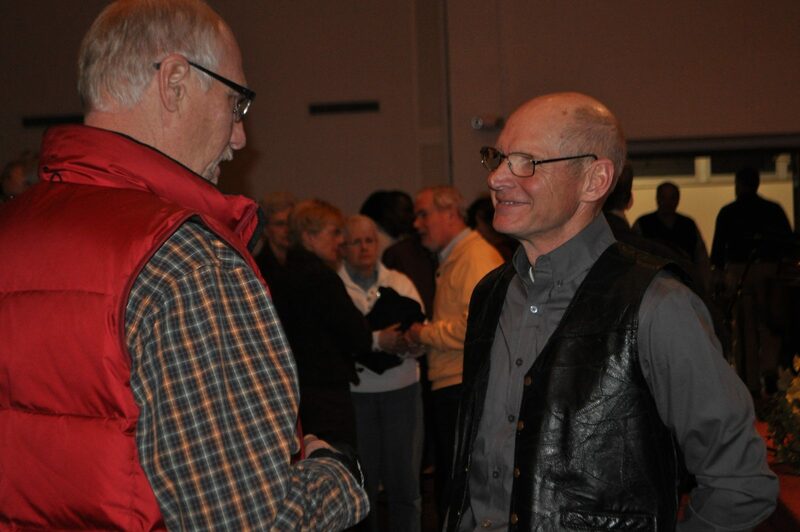 Jim Hocking, founder and executive director of Water for Good, talks with an audience member after Sunday night’s program. Three groups affiliated with the Fellowship of Grace Brethren Churches have locked arms to help the people of the Central African Republic (C.A.R.) – a country where the Grace Brethren have ministered for nearly 100 years. The partnerships were announced Sunday evening at the Winona Lake (Ind.) Grace Brethren Church (Bruce Barlow, lead pastor) as first-hand reports from the country were presented by Dr. François Ngoumape, Barb Wooler, Mike Taylor, and Jim Hocking. Encompass World Partners, Three Strands, and Water for Good are joining to provide humanitarian assistance — food, medical care, and sanitation — in the C.A.R. A common website, www.relief4thecar.com, is the go-to site for making donations to the effort, which will be administered by the church in C.A.R. In addition, Encompass is encouraging believers around the world to set aside January 20 as a Day of Prayer for the C.A.R. The Central African Republic is currently involved in an extremely complex state of bloody violence, with many different forces involved. In March 2013, Seleka rebels toppled the former president François Bozizé and replaced him with Michel Djotodia, who resigned last Tuesday. Throughout December there were many clashes between rival groups and last month more than one thousand people are believed to have been killed. The fighting has led to a dire humanitarian situation. The number of internally displaced people has more than doubled to 935,000 since December, the UN says. “It’s emotional for those who work there because our friends are being hurt,” said Hocking, who is the founder and executive director of Water for Good (ICDI), an organization that helps the country through water wells, agricultural consulting, and radio broadcasting. Wooler, director of Project Hope and Charité, an orphan care ministry in the C.A.R., is leading the effort at Encompass World Partners to provide one million pounds of food for the country. She noted that because of the war in the spring, gardens were not planted or were destroyed as people fled. The result was no harvest in the fall. She estimates that half the country is without food and many now are eating the seed that would normally be planted in the spring. “We are asking God to raise a million pounds of food,” she said. That’s 10,000, 100-pound sacks of grain at $50 each. Three Strands, a medical ministry founded and led by Taylor is working with African staff to ensure that medical needs are met. Taylor shared the story of Paul and Denise Dibona, a doctor and nurse who have risked their lives to secure medicine for those with whom they work. Recently, Water for Good teams dug 25 latrines in two days at the Bangui airport, where an estimated 100,000 people have sought refuge. He noted that the path forward is not going to be easy and each organization is doing what they can to implement relief efforts on the ground in the C.A.R. He also said that the efforts have not gone unnoticed. “There are people who recognize that the church in America is helping,” he said. 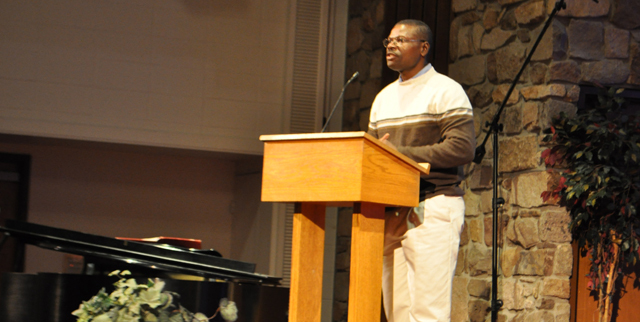 The evening led off with Dr. Ngoumape sharing about the political and religious situation. He stressed that many the media have termed “Christian” are actually anti-militia. “They are young people from the villages, not Muslim, who are not happy with the situation in the country. He thanked the audience for their prayers and presented three additional prayer challenges. “Pray for the churches,” he said, noting that one of the church buildings in Bangui had been burned that morning. Finally, he asked for prayer for the young people of the country. “When you heard of 3,000 being killed,” he said. “Eight percent of them are young people.” He noted that this creates an atmosphere of retaliation. A complete video recording of the evening will be posted as soon as it is available.